Canada is presently celebrating the 25th anniversary of one of the most important legal documents in the history of our nation. I am pleased to announce that I had the privilege of seeing Liberal leader Stéphane Dion stand up in the alumni auditorium of Ottawa U this morning to pay tribute to the Charter of Rights and Freedoms. 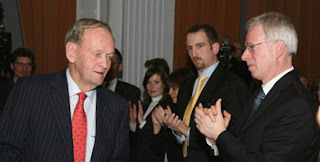 Former prime minister Jean Chrétien also attended later this afternoon however, I was unfortunately not able to attend as it was time to get down to studying for my exams (as I should be doing now). The event itself was organized by the Canadian studies department here at the university and as such was not intended as a political rally (at least so they told us at the door) however, Dion did not waste the opportunity to absolutely blast Prime Minsister Stephen Harper for not showing up or even sending one of his ministers. He was also quick to condemn the PM for having canceled the Court Challenges Program and having meddled in the judicial appointment process, among other issues. A little inappropriate? Maybe, but certainly fun to watch, and if it gets the message out about Harper's abismal record regarding human rights in Canada it is probably worth it if you ask me. Anyways, back to studying for me! De mon avis, il faut que j'avoue que je ne croyais pas qu'une telle question allait se présenter sans qu'un autre gouvernement péquiste ou un gouvernement adéquiste soit élu au Québec ou que Stephen Harper ait gagné sa majorité à la chambre des communes. Ça se peut que je sois en train de réagir trop fort, d'après tout, Dumont n'est que le chef de l'opposition au Québec et a beaucoup de travail à faire avant qu'il puisse accéder au pouvoir dans la belle province. Mais ce n'est pas hors question que l'ADQ en retire au moins un gouvernement minoritaire lors des prochaines élections. À mon avis, l'adhésion du Québec à la constitution de 1982 sera un grand coup pour n'importe quel Premier ministre. Mais à quel prix? Je ne veux pas dire que le prix demandé par Dumont me semble irraisonnable, il faudra qu'une entente détaillée soit conclue avant que je puisse en faire une décision à ces égards. Mais il me semble que le vrai tort dans ce que Dumont propose c'est que ceci risque de créer encore une autre échec constitutionnel ce qui pourrait accroître les sentiments d'isolation chez les québécois. Par contre le fait que les conséquences d'un échec constitutionnel seront graves ne doit pas nous empêcher de corriger "l'erreur de 1982". On ne devrait pas permettre au phénomène "can of worms" de nous empêcher non plus. Il me semble qu'un accord face au pouvoir du gouvernement fédéral de dépenser pourrait se faire sans l'inclusion des autres provinces en vertu de l'art 44 de la loi constitutionnelle de 1982. Même si je ne suis pas prêt à me fier au gouvernement Harper, la constitution est d'une importance suffisante qu'il ne faut pas permettre aux sentiments partisans de nuire à l'occasion d'enfin pouvoir régler la question constitutionnelle et même possiblement enfin écraser le mouvement séparatiste au Québec. Pourtant, on est encore très loin de pouvoir trancher cette question, car Jean Charest demeure toujours le Premier ministre du Québec, et Stephen Harper n'a pas encore sa majorité (et de mon avis il ne le mérite pas!). A number of my blogger friends such as Vicky and Marc-André have both weighed in on the subject of what limits (if any) should be imposed on an individual's right to self-expression over the past few months, and with the latest "shock-jock" scandal just breaking south of the border (see link below), I thought I'd add my own two cents. It seems that radio show host Don Imus has drawn the ire of a substantial portion of the American public by his repeated use of racial and sexist slurs. As the above link demonstrates, this is nothing new for this individual. It appears that this time however, he has managed to step into a hornet's nest because the young black women he called "nappy-headed hos" are fighting back. It seems that the young ladies in question have actually rallied together and managed to attract the attention of such powerful activists as the Reverends Al Sharpton and Jesse Jackson, who lobbied the network and appear to have succeeded in convincing the network to throw Imus off the air. The problem? Well, obviously this brings up the major issue of free speech. From a legal point of view, it's not as big of a problem here in Canada, where all of our most important rights are guaranteed by the charter, but are subject to the reasonable limits clause (section 1 of the charter). In the states however, rights take on a more absolute form. Already, presidential hopeful John McCain has reportedly come out in favour of Imus. The obvious argument in favour of the remarks is that no matter what he may have said, what he said was just words, and that as a society the American people should not be picking and choosing what they want to hear. The second they start to forbid one form of speech, they are leaving all other forms of speech, such as political criticism, wide open. As important as it is to protect free speech, I have to say that I am quite comfortable limiting what someone does and does not have the right to express on national television. So long as the limits imposed on someone's rights are "reasonable" as is the general standard here in Canada (there is a more detailed set of standards outlined by the Supreme Court in R. v. Oakes). As I wrote before when commenting on Marc-André's blog, the courts have long since enforced the tort of slander, which essentially allows an individual to seek re-payment if someone has unjustly made disparaging remarks about them. I can therefore see no reason why a group of people should not have the right to protection under the law from hateful remarks being made about them for no reason. It is one thing to point out foul deeds committed by one person; it is completely another thing to randomly assign a bunch of negative traits to an entire group of people based simply on stereotypical beliefs. In Imus' case, he has been lucky enough not to be prosecuted (I am not aware of what if any hate-speech legislation exists in the states). The fact that he has at least admitted that his comments were "stupid" has at least some sort of redeeming quality to, however given that this is not exactly a first strike for the man, I am willing to say that he has been punished fairly. Well, as suddenly as she burst onto the political scene, it seems that Belinda Stronach is leaving politics just as quickly. I don't think I've ever been shy about the fact that I am not exactly her biggest fan. I was really upset at how she left a high profile position in the official opposition party to become a cabinet minister in Paul Martin's government. I too would have felt far more comfortable if she had simply left the Conservative party to sit as an independant until she could be elected as a Liberal. To be fair though, she was re-elected in her riding in spite of the way her big switch happened. So if nothing else at least her riding forgave her. Which I seriously doubt will be the case for David Emerson or Wajid Kahn. I don't think any of us will ever forget the infamous dog remark made by her former boyfriend Peter MacKay, Canada's current Foreign Affairs Minister. I must admit that I lost what little respect I had left for MacKay over this incident. Not simply because he let his feelings get the better of him, but because he was too cowardly to simply admit that he had made a mistake or at least to deny that he had said it, he was revealed for the weasel that he is. If nothing else, Belinda made our lives interesting, as we never quite knew what to expect of her. She was, at least in appearance a strong advocate for the promotion of the status of women. As one of the author's of the Pink Book, she helped set forth some of the Liberal Party's most progressive women's policy. I can't say that I really agree with Vicky all that much, as I don't think that canadian women ever needed to be convinced of what they can and can't do. But one thing is undeniable, Belinda played in the big leagues and held her own in a male dominated arena. She refused to bve cast aside like the Helena Guergis and Rona Ambrose "types" of the Canadian political world. I'm sure Belindsa's vast family fortune didn't hurt in this regard, but there is certainly no shortage of men in Canada's parliament with this very same advantage. Like I say, I'm not exactly her biggest fan, but I think I will miss her. If nothing else, Canadian politics will miss having such a strong female voice. I just wanted to bring to everyone's attention that the president of the UOYL, Mr. David Taylor has resigned his position. He has been a tremendous asset to the club and he shall be missed. Best of luck Dave! I am attaching his official letter of resignation with his permission. It has come to my attention that my holding and continuing to hold the position of President with our organization is in conflict with my duties in the Senate. As such, with this e-mail I am tendering my resignation as President effective immediately. Also effective immediately, Patrick Kilfoil will become President as per Article 7, Section 2(a) of our constitution. I regret that I am submitting this in e-mail form, but it is time-sensitive and my being in Edmonton makes it somewhat difficult to submit a signed letter at this time. Upon my return to Ottawa on April 10 I will tender the appropriate hard copy documents to Patrick at the earliest possible convenience. I would also like to take this opportunity to express my gratitude for all the hard work we have done together over the past months - I have truly enjoyed my time with the club. I wish all of you the best in your future efforts and I know that the club is in good hands. Looks like the liberals are striking back against Stephen Harper's latest string of attack ads, Give 'em Hell guys! Eastern Regional Policy Parliament 2007 - a major success!!! This past weekend was an important one for the UOYL and the Ottawa-Vanier Young Liberals, because on Saturday March 31st we played co-hosts to the 2007 Eastern Regional Policy Parliament. This was my second policy parliament as policy director of the UOYL, and my first time as part of the organizing team and I am pleased to say that it went off without a hitch! The ERPP began with an interesting foreword from Ottawa-Vanier MP Mauril Bélanger. Naturally, he was his usual well-spoken self with much to say about the importance of engaging the grass roots of this party! About midway through the day's activities we received a visit from local MPP and member of cabinet, Jim Watson. Mr. Watson had lots to say about the encouraging physical activity for youth. Perhaps the most impassioned speaker of the afternoon was Ottawa-South MP David McGuinty, who gave made a strong argument as to just how imperative it is that Canada does something to address the issue of climate change... Al Gore would be proud! We also had the privilege of welcoming Ottawa city councilor Clive Doucet who added some very interesting supplements to Mr. McGuinty's speech, and also gave a very well thought out talk on urban expansion. Of course the real point of the meeting was for young liberal from across the Easter Region of the province to come together and discuss policies! I am pleased to report that we had members visit us from as far away as Queen's University and Kingston and the Islands. We got the chance to discuss such important issues as Canada's military presence in Afghanistan, designating certain zones of Ontario as bilingual, and the need to fight against the HPV virus. Ultimately, the group decided to send the two following policies to the Ontario Young Liberals Summer Fling. We hope they are adopted! Be it further resolved that this will allow an alternative to University or College education, while allowing students with the talents of practical application or skilled labour to begin training at an earlier age; thereby establishing themselves as more qualified to re-commence and/or complete their skilled labour training afterwards at a reduced financial cost and shorter formal training period, as a result of the incorporation of their secondary school introduction to the skilled trade of their choice. And be it further resolved that the Liberal Party of Canada and the Ontario Liberal Party encourage all parties involved to foster linkages between short and long term addiction rehabilitation facilities. One more little announcement, on Thursday March 29th, I had the privilege of representing the UOYL alongside our executive vice president Patrick Kilfoil in an all-party debate that was organized by PIDSSA (formerly the PSSA - Political Science Student Association). I am equally pleased to report that together with our Green Party and NDP counterparts we thoroughly embarrassed the conservatives! Unfortunately I can't take much of the credit for this, as the conservatives did most of the work themselves.